When Sara was finally back to work in full force after the shooting she also received a promotion. It didn’t really come as a surprise, the Sunset Valley Police Department was more understaffed than ever, her mentor Jesse had been killed and both his niece, lieutenant Gradle and Sara’s fiancé’s mum, Alyssa Prentiss had retired. And so now she was lieutenant Caliente. It was exciting to think that once, not so long ago, she was just a desk jockey down in the forensics department and now she was up here, in her own office… A strong knock on the door interrupted her running thoughts. Sara stood up quickly out of respect for the older man and remained standing until he sat himself in a chair opposite her desk. He didn’t waste any time looking around but focused his light green eyes on her before speaking. “Morning lieutenant. Are you busy?” He asked. It felt odd hearing him use the title and Sara shifted nervously in her seat. “Not particularly.” Sara said honestly. Sunset Valley was void of crime in the most part, there was an occasional burglary,like the recent one in Phoibe Santoro’s house. It wasn’t the first time she was targeted, it probably had to do with her living alone in a big house all in glass, giving everyone a good look of her lavish belongings. At least now she had enough good sense to get an alarm like everyone else in town and the perpetrator was successfully apprehended. Of course there were always speculations of a crime organization existing and operating out of their small town but weather those speculations were true or not remained to be proved, and after recent event there weren’t much people at the stations disposal to launch any official investigation into such matters. “There are two new employees coming in on Monday.” Mr Hoves said leaning closer over Sara’s desk. “Locals?” She asked and the man nodded. ” Fresh from the academy.” He added. “Both are very young, the girl graduated from college, she studied psychology I think. Vanessa Mayor.” He read from a piece of paper that he procured from his pocket. “The boy is a college dropout but he had graduated the academy the top of his class. Everyone there agrees he has what it takes. He is also the son of our State Representative, Mikhail Kerry’s his name. I’ll email you their files I just wanted you to know they’ll both be placed here, in your department.” Sara nodded. She did need new manpower and she had to hope those kids would fit in quickly because their new job was dangerous and unforgiving she thought remembering a flash of pain as a bullet struck her leg. “And how are you?” Sara felt awkward under a warm but observant gaze of the man in front of her. He reminded her so much of his uncle, Sara’s mentor who died the same day she got shot. She touched her leg absently. “Good, I am glad to hear it. It is never easy loosing a partner, especially the way it happened to you… ” Sara’s smile disappeared as he remembered that forsaken warehouse. Not a day went by that she didn’t think about it… “Well anyway, I have to go back to work, I won’t forget those files…” He added quickly probably noticing the change in her face. Sara nodded before walking him out.Lieutenant Caliente…. It still sounded so odd. Another ray of sunshine for a cold and bleak winter. 🙂 This time it is from socallucyfan, author of Once Upon A Legacy. Once Upon A Legacy is a fairy-tale themed legacy with each generation being a separate fairy tale, the first one was Cinderella and the second one that is currently in progress is Sleeping Beauty. I enjoy both generations a lot, and I hope you will too, so visit it when you can. I already have two of these, first from Sylianna, author of The hunt for Freedom and A Ramble A Day and the second one from Pink Gumdrops. There you can find my nominations, questions and answers to questions asked by Sylianna and Pink Gumdrops. 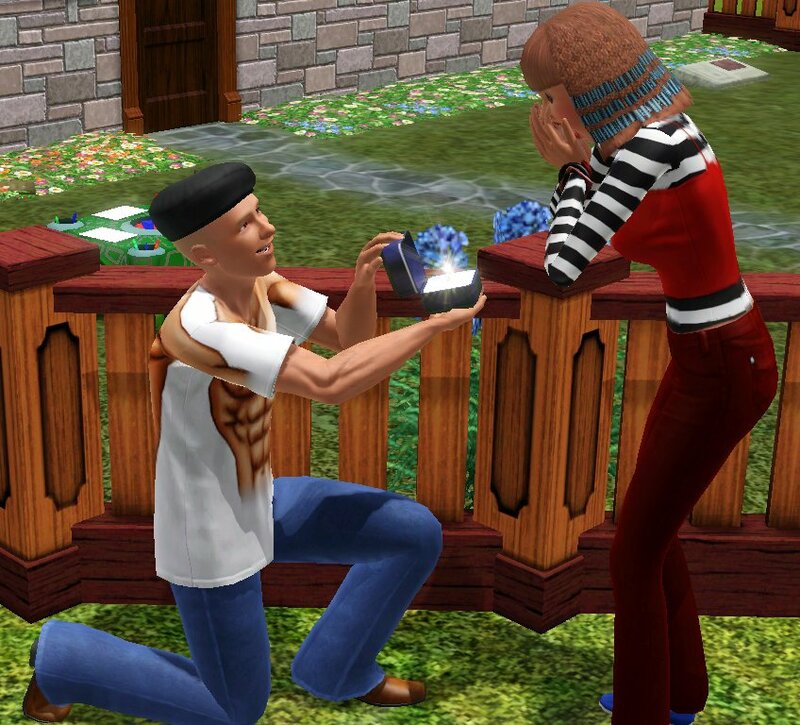 I have always made up stories when playing sims, from my early days of playing sims1. Back then I was in elementary school I had made my whole class in the sims and played them all and then told my friends what happened, who had a child with who, who did what for a living, who was a star and who was a magician…. Then came Sims2 with actual passing of time and generations and it gave birth to many of my different stories I mostly kept to myself. Maybe I should have kept my Sims3 stories to myself as well but I decided to try and throw them out there, see if someone might like it. Spring maybe, although where I live spring had in recent years became reduced to a few brief weeks. Right now I am wearing a jeans and a long sleeved red shirt with white dots. Can’t think of anything. In either English or my own language. There are many places I have never been but hope to go, it is very hard to single out anything really. I like a lot of different things really, I could’t think of anything to single out… If I have to I would go for books and say: the Harry Potter books, ASOIAF books, the Witcher books, and almost everything from Stephen King.